Pampas Grass is a sort of grass that dwells mostly in the Pampas of South America. It is a very pretty, large and unique kind of grass. ravines. An amazing feature about Pampas Grass is that it can live in almost any habitat. This amazing grass can grow in hard, rocky areas, flooded areas, dry and damp ground plus its normal habitat. The leaves die during frosts in northern climates, but grow back in the spring. The habitat it flourishes in is a damp, warm environment like that of the South American Pampas. Pampas Grass can grow to an impressive size for grass, about 8-12 feet tall. Its leaves are only .5 inches to .75 inches wide but can be 10 feet long. It grows in large clumps called tussocks. Each tussock is about 12 feet tall with many plants in it. The leaves are razor sharp and could slice you open just by rubbing against them. The leaves are a deep green color. The Pampas Grass has large pink plume like flowers that give the grass an ornamental sort of look. It also has oval shaped seeds growing off of it, which are .25 inches long. Its seed has a tan crusty shell. The female plants are prettier and their flowers are fuller. Pampas Grass can adapt to most places and can adapt fairly quickly. This quick adaptation is the product of a deep root system that digs down and finds water so it can survive in the driest areas. Pampas Grass is used in many ways. A common use is as a hedge because of the razor sharp leaves and stiff stems. It is used mainly as a decoration. Pampas Grass makes a nice ornamental plant because of its large plume-like flowers. The only setback to having it as an ornament is the sharp leaves because just brushing against it can give you a cut that becomes inflamed. Many people put this plant in garden beds or on lawns. It is not farmed for any purpose because there is no value in it for farmers. The Pampas Grass is not an endangered plant. These plants are very common in the South American Pampas. This plant has an incredible seed output. Each plant puts out over 1 million seeds in its life time. 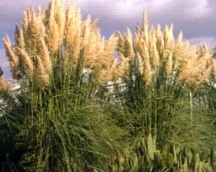 This large seed output results in Pampas Grass being a very prolific plant. California has listed them as an invasive weed that pushes out native plants. They are banned in New Zealand and Hawaii and are on their noxious weed list.